The U.S. Environmental Protection Agency recognized the Mid-Atlantic States Section of the Air and Waste Management Association's (MASS-A&WMA) Air Pollution Education and Research Grant (APERG) program as one of 21 organizations to receive a 2002 Clean Air Excellence Award for outstanding commitment to preventing air pollution and improving air quality. These 21 organizations were honored out of a total of 141 organizations that requested consideration for the award. The APERG program was honored in the Education and Community Outreach Category. A special awards ceremony and reception was held on March 20, 2003 at the Mayflower Hotel in Washington D.C. in honor of this year's Clean Air Excellence Award winners. MASS-A&WMA was commended for its dedication and for its accomplishments in education. The MASS-A&WMA APERG program has given out over a half million dollars in scholarships to deserving doctoral students and post-doctoral scientists in the Mid-Atlantic region. This program is a highly competitive merit based award that gives at least four $25,000 scholarships per year to support graduate and post-doctoral education and research. The program has yielded results by supporting research work that is creating new knowledge resulting in peer-reviewed publications. The APERG program is also helping doctoral students and post-doctoral scientists achieve their goals and continue their work after graduation. APERG Committee Chairman Dr. James Blando (R) accepts the Excellence Award from USEPA Assistant Administrator Jeff Holmstead (L). 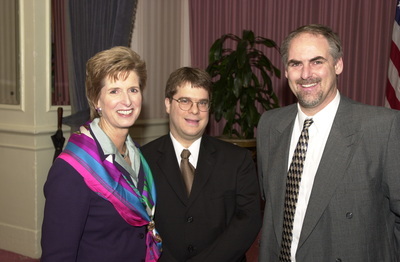 USEPA Adminstrator Christine Todd-Whitman (L) met with Dr. James Blando (C) and Kevin Krause (R) at the ceremony. The U.S. E.P.A. Administrator Christine Todd Whitman met with Dr. James Blando, Chairman of the APERG committee, and also Kevin Krause, Treasurer of the APERG committee, during the awards ceremony. Ms. Whitman was very impressed with the program and personally thanked MASS-A&WMA and the APERG committee for running such an important program: "Thank you very much for your efforts, MASS-A&WMA certainly demonstrates how innovative programs can help to improve the environment." 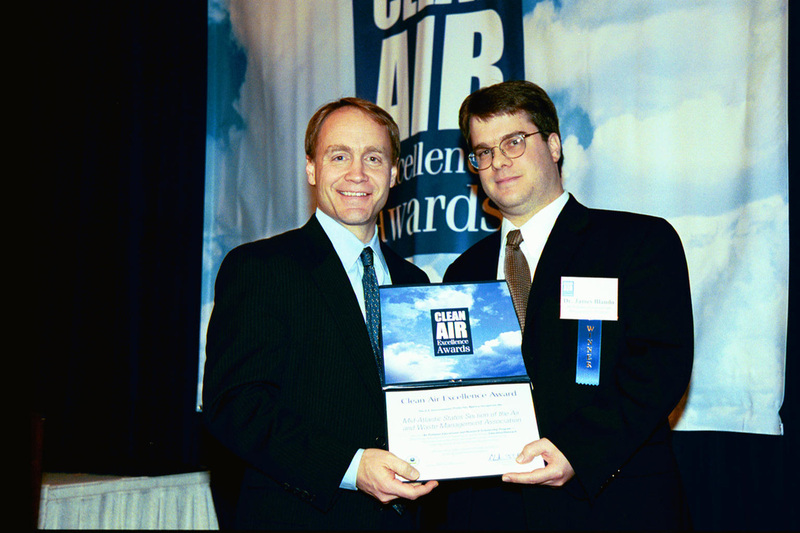 The Clean Air Excellence Awards program was established in 2000 at the recommendation of the Clean Air Act Advisory Committee (CAAAC), a senior-level policy committee that advises the U.S. Environmental Protection Agency on implementation of the Clean Air Act. The awards program recognizes both individuals and organizations that have undertaken the risks of innovation, served as pioneers in their fields, and improved the environment in the process. 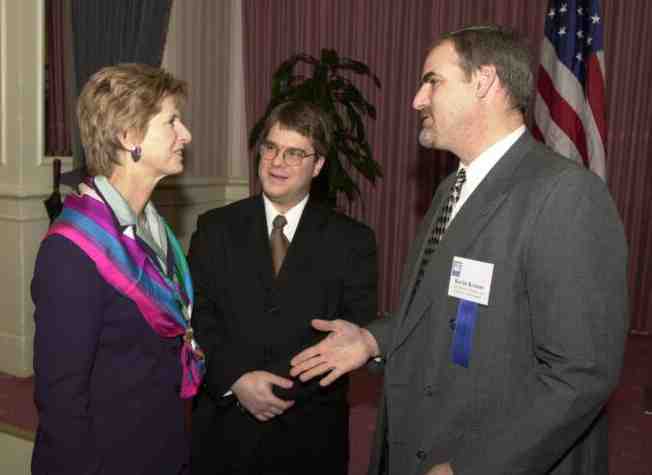 For more information about the U.S. EPA Clean Air Excellence Awards, visit http://www.epa.gov/oar/caaac/clean_award.html.